Managua (AFP) - Nicaragua's veteran leader Daniel Ortega defended brutal action by his forces against anti-government protesters Monday, as the United States warned he and his wife were "ultimately responsible" for deaths and rights violations. In the latest of a number of foreign media interviews the usually hermetic president is now giving, Ortega told the Euronews and CNN Spanish television channels the unrest was fomented by the United States. He described armed and masked paramilitaries seen cooperating closely with his security forces against the protesters as "volunteer police." And Ortega reaffirmed his rejection of opposition calls for early elections or his resignation. That "would open the doors to anarchy in the country," he asserted to Euronews. The interviews showed that the former leftwing guerrilla who has ruled Nicaragua for 22 of the past 39 years, was digging in despite growing international condemnation. Three months of turmoil have killed more than 300 people, according to Nicaraguan rights groups and the UN. Ortega disputes that count as "not correct." He gave his own death toll of 195, including two dozen police officers, as well as paramilitaries, sympathizers of his ruling Sandinista party and other civilians. 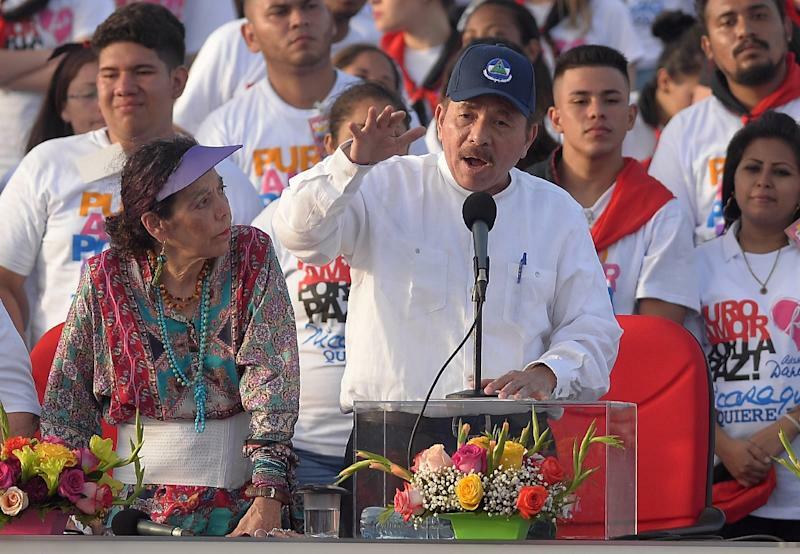 Although tensions have diminished in the past week and a half following intense armed operations against protest hubs resentment against Ortega and his wife Vice President Rosario Murillo simmers unabated. On Monday in Leon, a northwestern town that was formerly a bastion of Sandinista support before many turned against the party, demonstrations were held in front of state-run hospitals where some staff have been sacked for treating wounded protesters and expressing sympathy with their cause. Another demonstration took place in the capital, with Nicaraguan journalists demanding an end to assaults against them. Over the weekend, thousands of people marched in Managua to show support for the Catholic Church, which has been mediating unsuccessful talks between Ortega's administration and the opposition. The president has accused the bishops taking part of siding with the "coup-mongers" seeking to topple him, and allowing churches to become shelters for "terrorists." Recent marches have taken place with no sign of police monitoring or confrontation. Ortega said the turmoil is essentially over since mid-July and things are getting back to "normal." Even though he admitted the tourist industry had taken a hard blow, "the country is recovering" overall, he affirmed. Ortega complains that foreign media coverage of the unrest falsely suggests most Nicaraguans want him gone. "Not all the people" are against him, he told Euronews, only "part of the population." The real root cause of the violence, he argued, were US entities that for the past decade, he said, have been "allocating millions so that Nicaragua upholds 'democracy'... but which are diverted to destabilize the country and encourage armed actions." He said: "The truth is that we are facing a powerful enemy that has intervened militarily in Nicaragua, which is the United States." The allegation echoed anti-US rhetoric advanced by Nicaragua's Latin American allies Bolivia, Cuba and Venezuela, as well as Iran. The accusations from international rights groups and regional bodies, Ortega told CNN Spanish, "is a war through social media." He said he was ready to accept mediation with the United Nations to restart the stalled dialogue with the opposition. The president rejected any suggestion that his unbending position was pushing the country toward worsening conflict. "I don't believe Nicaragua is on the brink of civil war," he told CNN Spanish. "The people are tired" of the unrest already experienced, he said. Ortega, 72, is a longtime bete noire of the US government. He headed a left-wing Sandinista government during the Cold War, and returned to power in 2007. The United States has been stepping up its scrutiny of the violence in Nicaragua and is considering extra sanctions on top of those already applied to top officials. In a statement, the White House said it "strongly condemns the ongoing violence in Nicaragua and human rights abuses committed by the Ortega regime." It added: "President Ortega and Vice President Murillo are ultimately responsible for the pro-government parapolice that have brutalized their own people." The United States "stands with the people of Nicaragua," the White House said, demanding democratic reform and an end to the bloodshed.